Bookshelf by Vital Source is an e-text delivery system for higher education that collaborates with more than 300 publishers and it is used in 200 countries worldwide. It is an e-textbook distribution system that enhances learning through digital content. You are able to access it via Blackboard Learn wherever you are located. To access and manage your eTexbooks and user account via VitalSource visit the website VitalSource.com and access BookShelf or directly visit BookShelf and use your @acg.edu email credentials to login. Visit your Blackboard Learn course. Choose Bookshelf by Vital Source from the course menu. Click Open Bookshelf to see the eTextbook for your course. Click My Bookshelf eTextbooks to view all eTextbooks for all your courses. ATTENTION: If you are registered in a course that uses an e-textbook, please be informed that after the 50% Withdrawal period the initial access to your course’s e-book has expired. 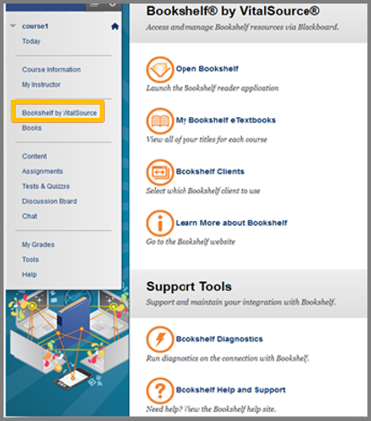 In order to receive the full license for access to your course’s e-textbook, you need to visit the e-textbook menu item and click to open and reactive your e-textbook . Click on the eTextbook(s) or Books link. When you try to open an eTextbook, you will be redirected to page with an acknowledgement message. This page informs you about the fee that will be charged if the eTextbook is launched. So, in case you have a hard copy of your book and don’t wish to use an eTextbook do not click the Launch button, because you will be charged with the price of the e-Textbook. In case you will use the e-Textbook, click the Launch button so as to proceed. After you click Launch, you will be redirected to another page asking if you have a VitalSource account. Log in with or account or if you don’t have one press NO and follow the instruction to create one. After you login with your VitalSource account another message will appear. Press continue to be redirected to the eTextbook page.